This training game is derived from a dolphin research project in which I and others participated, "The creative porpoise: training for novel behavior," published in the Journal of Experimental Analysis of Behavior in 1969. It has become a favorite with dog trainers. It's especially good for "crossover" dogs with a long history of correction-based training, since it encourages mental and physical flexibility and gives the dog courage to try something on its own. Take an ordinary cardboard box, any size. Cut the sides down to about three inches, and put the box on the floor. Click the dog for looking at the box. Treat. If the dog goes near or past the box, even by accident, click. Next, after you click, toss the treat near or in the box. If the dog steps toward the box to get the treat, click the step and toss another treat. If he steps into the box, great, click again, even if he is eating his previous treats, and offer him another treat in your hand. Sometimes you can cook up a lot of "box action" in a hurry this way: click for stepping toward or into the box. Alternately toss the treat in the box and hold the treat out in your hand so the dog has to come back to you. 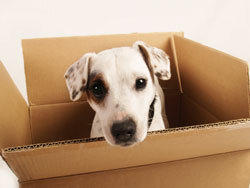 If the dog is reluctant to step into the box, and so doesn't eat that treat, it doesn't matter: he knows he got it. If treats accumulate in the box, fine. When he does step into the box, he'll get a jackpot. If you decide to stop the session before that happens, fine. Pick up the treats in the box, and put them away for a later session. Remember, never treat without clicking first, and always click for a reason: for some action of the dog's. If you need more behavior to click, you can move yourself to different parts of the room so the box is between you and the dog, increasing the likelihood of steps in the direction of the box. Don't call the dog, don't pat the box, don't chat, don't encourage the dog, and don't "help" him. All of that stuff may just make him more suspicious. Click foot movements toward the box, never mind from how far away, and then treat. If you get in five or six good clicks, for moving in the direction or near or past the box, and then the dog "loses interest" and goes away, fine. You can always play "box" again later. In between sessions, the reinforcements you did get in will do their work for you; each little session will make things livelier the next time. You are, after all, teaching your dog new rules to a new game. If you have already trained your dog by conventional methods, the dog may be respecting the general rule, "Wait to be told what to do." So the first rule of this new game, "Do something on your own, and I will click," is a toughie. In that case, the box game is especially valuable, and the first tiny steps are especially exciting—although they would be invisible to an onlooker, and may right now seem invisible to you. End the first session with a "click for nothing" and a jackpot consisting of either a handful of treats, or a free grab at the whole bowl. Hmm. That'll get him thinking. The next time that cardboard box comes out, he will be alert to new possibilities. Clicks. Treats. Jackpots. "That cardboard box makes my person behave strangely, but on the whole, I like this new strangeness. Box? Something I can do, myself? With that box?" Those are new ideas, but they will come. If your dog is very suspicious, you may need to do the first exercise over again once, or twice, or several times, until he "believes" something a human might phrase thus: "All that is going on here is that the click sound means my person gives me delicious food. And the box is not a trap, the box is a signal that click and treat time is here, if I can just find out how to make my person click." Whether these things occur in the same session or several sessions later, here are some behaviors to click. Click the dog for stepping in the box, for pushing the box, pawing the box, mouthing the box, smelling the box, dragging the box, picking up the box, thumping the box—in short, for anything the dog does with the box. Remember to click WHILE the behavior is going on, not after the dog stops. As soon as you click, the dog will stop, of course, to get his treat. But because the click marked the behavior, the dog will do that behavior again, or some version of it, to try to get you to click again. You do not lose the behavior by interrupting it with a click. You may end up in a wild flurry of box-related behavior. GREAT! Your dog is already learning to problem-solve in a creative way. If you get swamped, and can't decide which thing to click, just jackpot and end the session. Now YOU have something to think about between sessions. On the other hand, you may get a more methodical, slow, careful testing by the dog: the dog carefully repeats just what was clicked before. One paw in the box, say. Fine—but right away YOU need to become flexible about what you click, or you will end up as a matched pair of behavioral bookends. Paw, click. Paw, click. Paw, click. That is not the way to win this game. So, when the dog begins to offer the behavior the same way, repeatedly, withhold your click. He puts the paw out, you wait. Your behavior has changed; the dog's behavior will change, too. The dog might keep the paw there longer; fine, that's something new to click. He might pull it out; you could click that, once or twice. He might put the other paw in, too—fine, click that. Now he may try something new. And? Where do we go from here? Well, once your dog has discovered that messing around with the box is apparently the point of this game, you will have enough behavior to select from, so that you can now begin to click only for certain behaviors, behaviors that aim toward a plan. It's as if you have a whole box of Scrabble letters, and you are going to start selecting letters that spell a word. This process is part of "shaping." Variations and final products: What could you shape from cardboard box behaviors? Initial behavior: Dog puts paw in box. Click, toss treats. Then don't click, just wait and see. Maybe you'll get two paws in box. Click. Now get four paws in box. Get dog in box. Options: Sitting or lying in box; staying in box until clicked; staying in box until called, then clicked for coming. Uses: Put the dog to bed. Put the dog in its crate. Let children amuse themselves and make friends with the dog by clicking the dog for hopping into a box and out again (works with cats, too). One third-grade teacher takes her papillon to school on special events days, in a picnic basket. When the basket is opened, the dog hops out, plays with the children, and then hops back in again. Initial behavior: Dog grabs the edge of the box in its teeth and lifts it off the floor. Uses: Millions. Carry a box. Carry a basket. Put things away: magazines back on the pile, toys in the toy box. A dog that has learned the generalized or generic rule, "Lifting things in my mouth is reinforceable," can learn many additional skills. I don't know what good this is, but it's not hard to get; it crops up often in the "101 Things to Do with a Box" game. If the dog paws the near edge of the box hard enough, it will flip. My Border terrier, Skookum, discovered that he could tip the living-room wastebasket (wicker, bowl-shaped, empty) over on himself, so that he was hidden inside it. Then he scooted around in there, making the wastebasket move mysteriously across the floor. It was without a doubt the funniest thing any of our dinner guests had ever seen a dog do. Since terriers love being laughed with (but never at), clicks and treats were not necessary to maintain the behavior once he had discovered it—and he learned to wait until he was invited to do it, usually when we had company. timid Papillon and the box! Submitted by dena on Thu, 2011/07/21 - 4:19am. This is a great game for a shy/timid dog. I've just had Little Freddi, my 3 year old female Papillon, about 4 months. She's very timid/shy/scared of objects (I think she may have some prior "issues" with being scolded or something, plus was probably trained not to mess with things unless told to do so). I started the box game with her yesterday (even though we're both new to this "clicker"). At first she wouldn't go near the box...tonight (our third box session) she hit the "cheese jackpot" with one foot firmly planted in the box! I'm so proud of her! I can see the confidence growing in her! Plus it's a great way to reinforce that "click = treat!" I saw that process happening in her head, too. And, she did some other "behaviours" that I was able to "capture." Submitted by DKHickman on Tue, 2011/04/05 - 3:16pm. I have a rescued lacy dog who is very cautious. He was scared of the clicker when I first introduced it to him, if a bundle of leaves floats by in the wind he approaches it like it's a time bomb. He is brilliant, and learns tricks faster than any dog I've ever owned, but he's not very confident. ANY adverse reaction freaks him out totally (a raised voice directed at a football player on the tv will cause him to cower and come up to us like he did something wrong). Because of this, I've focused on positive reinfocement almost exclusively, but "shaping" isn't something he's particularly adept at. Our doberman, however, is VERY good at it (but we have had her since puppyhood, the Lacy was already an adult when we found him). I'm excited to see if "101 things to do with a box" helps facilitate his shaping abilities... In fact, I'm going to try it right now. Submitted by pattymac on Tue, 2010/11/23 - 10:38pm. It's hitting -40 C here and just too cold for walks...so I decided to try the box game!! I've done a bit of clicker work with my dog but couldn't find my clicker so just used YES. It's absolutely amazing how quick they catch on when you've done a bit of free shaping before and they really figure things out fast. So she first stuck her nose in the box, that worked, then she shoved the box, then she picked up the box, so then she brought me the box. Did that a few times then she put 1 foot in the box, then another and that was awesome. She's huffung and puffing like we went for a good long run and now she's settled down and chewing on her chewie. Submitted by lorenamie on Tue, 2010/08/24 - 3:56pm. I just found this very funny animation of a cat discovering 101 things to do with a box. Enjoy! Submitted by nicole_bodea on Fri, 2010/04/23 - 11:14pm. Awesome! You could really see dogs being mentally stimulated, and something they can choose to do. This game would be awesome for a shy dog, as it could build confidence for them. Clicker training is awesome! It has so many uses that you know will always be reliable and not just when the dog wants to be. Submitted by dena on Thu, 2011/07/21 - 4:14am. You're so right about this being a great game for a shy/timid dog. I've just had Little Freddi, my 3 year old female Papillon, about 4 months. She's very timid/shy/scared of objects (I think she may have some prior "issues" with being scolded or something). I started the box game with her yesterday (even though we're both new to this "clicker"). At first she wouldn't go near the box...tonight (our third box session) she hit the "cheese jackpot" with one foot firmly planted in the box! I'm so proud of her! I can see the confidence growing in her! Submitted by Indie on Fri, 2010/04/23 - 8:55am. Submitted by paulparsons83 on Mon, 2009/12/21 - 3:41pm. my sister`s son gave me Casper three weeks ago he is very good natured but needs a lot of training and love and tender care. I do have a cat called Cosmo too and a buddgie called bluey have just bought a clicker for my Casper. he sits and stays o.k and just beginning to lay down and comes to me when called. Casper is always trying to play with Cosmo but he just wants to be left alone and Bluey is just a bird chirping. Casper don`t get on with other dogs always going to fight with them I am trying to stop this can you give me any adivice thank you. Submitted by Lauren on Sun, 2009/04/05 - 10:33pm. we have been trying this 101 Things for a while now with 4 of our dogs, they just don't understand what to do, no matter what we have done. They are all clicker savvy, but none of them will flick their ear towards the box, let alone a paw or a glance at it. They have no interest in this game at all, and i have no idea on how to make this game more fun or interesting for them. Perhaps i could put treats in the box to get it started?? Submitted by metqa on Sat, 2007/03/31 - 5:38pm. I tried the box learning, and got my cat to get as far as getting completely inside the box, but then i made the mistake of giving her a "jackpot" for it, and she refused to go anywhere near or even look at the box after she got her big reward. (sigh) After she finished her jackpot, she just stared at me, begged for 10 seconds and lied down. I guess she figured she'd worked enough. Submitted by Diane Filler on Mon, 2007/02/19 - 9:20pm. I like to use this game when the training has hit a snag. As we all know if we or the dog is losing interest then it is time to stop the training for now. When this happens, I go to the box where everybody gets so much success. I love to see how they unleash ideas and keep trying different things with the box. It was very good for my youngest one that was starltled when the box first appeared...not she gets a kick out of having the box show up. Submitted by Virginia Broitman on Mon, 2006/10/09 - 9:59am. Karen, I like your thorough explanation of the box game. It's a tough one for traditionally- or lure-trained dogs to get into, and your explanation covers those difficulties well.